Classy. Creative. Cosmopolitan. As the capital of Spain’s Catalan region, Barcelona is the cultural melting pot on the Spanish east coast, and an epicentre of activity offering something for everyone. Whether you’re looking for stunning architecture; world-renowned art; shops, marketplaces and street markets; plush hotels or cheap and cheerful hostels; or simply a great meal and some even better drinks – Barcelona is the destination for you. 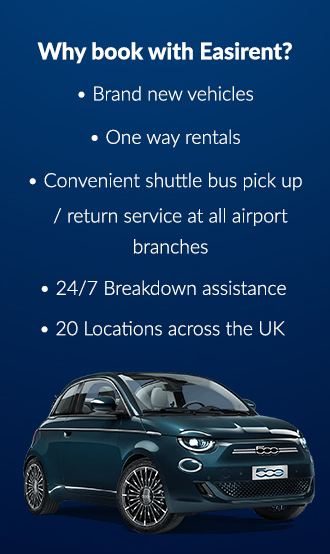 Barcelona-El Prat Airport services the city and is situated just a 12-kilometre (7.5 mile) drive from the city centre, and picking up your holiday rental car couldn’t be simpler. A friendly and dedicated team of staff are on hand to help you collect your rental car, and send you off on your holiday. Hordes of tourists flock to the Catalan capital each year to bask in in the Mediterranean sunshine, and catch a glimpse of some of Europe’s most iconic architecture. Barcelona is probably best known for the countless buildings and parks designed and built by Antoni Gaudi, a Spanish architect who is the best-known practitioner of Catalan Modernism. Hop in your hire car and head to some of the city’s iconic Gaudi sights, including: the Sagrada Familia, Park Guell and Casa Mila amongst countless other unmissable, unique feats of architecture. If you’re looking for a more relaxed haven away from the hustle and bustle of the city centre, then Barcelona is home to several beaches – all easily accessible in your holiday rental car – where you can while away the hours, sipping sangria against the sunset. And of course, basking on one of Barcelona’s beaches is entirely weather dependent, so if you’re after some winter sunshine and a little bit more adventure, why not head to the Catalan Pyrenees – a mountain paradise for trekkers and hikers worldwide? With five natural parks to explore, spas to relax in, and famous food to taste – it’s worth jotting down in your journal and taking a trip out there; plus, it’s only a two-hour drive in your rental car from Barcelona city centre. Fancy staying in a quirky boutique hotel which has a facade laden with thousands of eyes on stalks? Then you’re in luck, the Ohla Hotel is Barcelona’s luxury hotel which has been designed by surrealist Catalan designer, Frederic Amat. Slightly pricier than some of the other hotels on offer in Barcelona, Ohla Hotel’s interiors are chic and classy, with beautiful oak floors throughout and plush velvet throws draped across the beds. Plus, the hotel has a glass-sided rooftop pool with luxurious sunbeds for lounging around after a long day of exploring in your holiday hire car. For a cheaper option, most tourists in Barcelona opt to stay in a hostel. Having thrown off the ‘cheap and basic’ shackles of the past, hostels in Barcelona are highly competitive with the (much pricier) boutique hotels in the city, and today guests can stay in the city’s Casa Gracia for a fraction of the cost of a high-end boutique hotel. Casa Gracia was the city’s first boutique hostel, and it’s popular with tourists due to its vaulted ceilings, corinthian columns and picture windows. Decor throughout is calm and clean, and there’s a lounge area for the more sociable traveller, which hosts concerts, art exhibitions from local artists, and football matches which are projected onto a large screen. One of the best mid-priced hotels in the city is the B-Hotel, which will set you back £87 per night for the room – and there’s a lot included in that price. Featuring spacious rooms with quality furnishings, a stunning rooftop terrace with a pool, bar and sundeck, the B-Hotel is comfortable luxury at an affordable cost. As you can imagine, Barcelona is highly-esteemed for its food and drink; it’s big business – food and drink is taken very seriously, here. The Catalan cuisine is an ancient Mediterranean style of cooking, and it gives sunshine and patience pride of place. Of course, you can expect to find the usual Spanish plates across the city; paella and tapas are in abundance and there’s plenty of little spots to sip sangria in the sunset. If you’re after the traditional tapas experience, then you’ve got plenty of options to choose from – the city is full of cosy little hideaways, it just takes a little exploring to find the best one. One of the best for an authentic feel is Quimet i Quimet, a small establishment serving up some very traditional tastes, and is a favourite with both locals and tourists alike. Make sure that you arrive early to make sure that you bag yourself a good spot, and make sure ot try the montaditos – the sculpted tapas served on bread. Being on the coast, Barcelona is, quite naturally, famous for its seafood offering. For an elegant and affordable dining experience, head over to Botafumeiro, which takes its name from the huge incense burner hanging in the cathedral of Santiago de Compostela. Sourcing all its seafood that day from local harbours, Botafumeiro is the place to go if you’re looking to sample some of the local shellfish –the restaurant’s specialities are Galacian barnacles, razor clams and oysters. And finally – paella. No trip to Barcelona is complete without a plate of paella; and there are many places that serve paella, but if you’re after something a little fancier, head to Can Solé, an upmarket paella restaurant which serves up two types of paella, and has an open kitchen setting, so you can watch the chefs in action from the comfort of your table. Known to many as a European shopping city, Barcelona is a good place to head if you’re after a weekend of wandering around some of Barcelona’s best loved marketplaces; sophisticated shopping excursions, or a rummage in some of the city’s famous antique and bargain haunts. We promise that even if you’re not looking to make a purchase whilst you’re there, there’s a lot of temptation in the city’s numerous retail areas. With many of the city shopping streets scattered across the city, your holiday hire car is one of the best means of transport between the shops – plus, nobody fancies carrying bags of shopping from store to store, so a spacious boot is the perfect solution. Barcelona’s shops are a blend of modern and classic boutiques and stores, many of which have become a staple addition to the city, being family-run, independent retailers. There’s an antiques market which has called the city home since the 15th century, and is worth a visit if you’re after a unique gift for a friend or family member. Alternatively, if you’re looking for something a little more ‘high-end’, Barcelona has exactly what you’re looking for – the Barcelona Shopping Line is the city’s world-famous retail areas, and is also one of Europe’s largest shopping districts. The 5-kilometre shopping street – famously known as the Barcelona Shopping Line – is open to everyone, and is peppered with shops from one end of the street to the other. Not only famous for its shops, the street’s stunning architecture is also a big draw for those who set foot on its famous walkways. Head to the Avinguda Diagonal – the street connecting Camp Nou with Sagrada Familia – and here you’ll find some of the top names in fashion and retail. For those seeking something a little more unique, hop in your hire car and head to the Casc Antic, an area in Barcelona’s beautiful old town, which is a shopping haven for boutique lovers and unique little craft shop. There is also a shopping tour that you can join on to, if you so wish; the Barcelona Genuine Shops tour is priced at €25 and is a guided tour of some of the most inspiring shops in the city. There’s countless reasons why thousands of tourists flock to Barcelona each year, and – because there’s such a broad range of attractions and destinations to see – a weekend in the city often isn’t enough. However, we’ve narrowed it down to some of the most unmissable sights to see if you’re on a whistle stop tour, or if you’re staying a little longer. You’ll not get far in Barcelona before noticing a famous Gaudi landmark; the world-famous artist and architect exerted his influence in all corners of the Catalan city, and there’s countless trips that you can make in your rental car to catch some of the best. The Sagrada Familia, one of Gaudi’s most iconic creations sits in the heart of Barcelona city centre, and has been designated UNESCO World Heritage Site status. The construction of the Roman Catholic church, which towers over the city in all its gothic glory began in 1882, and, at the time of Gaudi’s death in 1926, was only 25% complete – and still stands unfinished to this day. The Sagrada Familia is due to be completed in 2026 – the centenary of Gaudi’s death. If you’ve got enough time, make sure that you head over to Park Guell, a beautiful Gaudi designed green space which overlooks the city and is the perfect place for a picnic, or a sunset stroll. Another world-famous export from the city is of course, football. FC Barcelona, which consists of footballing legends including Lionel Messi, Luis Suarez and Neymar to name just a few, has called Camp Nou its home since 1957, and has seen some stunning sporting feats over the years. Guided tours of the stadium are available, and football fans can revel in the stadium’s history on the ‘Camp Nou Experience: Tour and Museum’ where visitors can experience the emotion of setting foot on the famous turf, from the tunnel. Prices start at €20 and is open all year round to visitors.